Raven is anchored around a number of constant, common elements which provide the same functionality across the entirety of Raven. 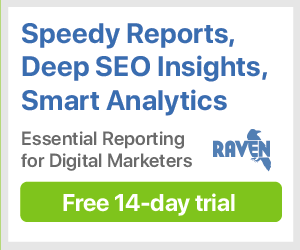 Whether you're looking at Google Analytics (as the above example is) or Link Manager, you can orient your way through Raven by keeping some of these buttons, sidebars and menus in mind. Profile Menu: Select an existing Profile or create a new one. Campaign Menu: Select an existing Campaign or create a new one. Global Icons: Navigate to CRM, Task Manager or Notifications (respectively). Preferences: A menu containing all of the preferences (including contact information, usage, user management and more) for your entire account. Help Center: Access help documents, along with a support contact form. Navigation Sidebar: Collapsable links to all of the tools in Raven. Header: The name of the tool that you're viewing and a small description. Date Range: The dates that your tool is displaying data from. This can be changed to fit presets or your own custom dates. This also controls the comparison date range. Tool Options: A menu of options pertaining to that specific tool. Tool Sidebar: Additional navigation for different sections within a specific tool. Often includes import/export options, settings and authorization assistance. Events Dropdown: A dropdown menu allowing you to choose which events are overlaid on a graph. Graph Legend: An explanation of the lines on a graph, which can be toggled on and off. Search Bar: Search through the table of data. Filter Sets: Create, view and save filters for use in tables and reports. Display Options: Pick and choose the columns displayed in a table. Table Options: Settings for the table itself, including pagination, export and history preferences.